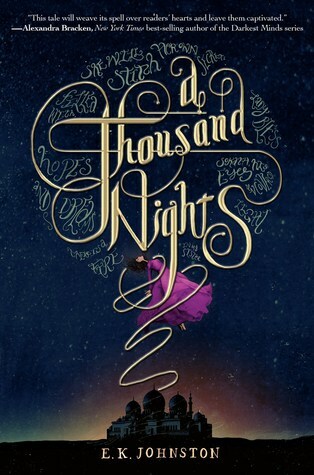 I hate to say it, but this retelling of the Scheherazade or One Thousand and One Nights just fell short. I know a lot of people have been comparing it to The Wrath and the Dawn, another retelling of the same legend, but I was “eh” about that one as well. The king, Lo-Melkhin, takes a new wife from various villages after he murders his current wife. The MC’s beautiful sister is sure to be next in his long list of murders, but she is determined not to let that happen, even if she has to go in her place. Ok. Can I just say, what is with the whole no names thing?! With the exception of a select few, everybody was referred to as their roles i.e. “sister” or Mother of my heart”. I understand that the author was trying to create anonymity (or at least that’s what I thought she was doing), but in reality it just made the characters one-dimensional and non-memorable. The writing, although meant to be beautiful and descriptive just dragged for me since the story seemed detached at times. Certain aspects of the plot were disjointed and felt that they came out of nowhere especially concerning the magic and some of the world building. It felt like characters gained powers out of nowhere and they weren’t explained very well, leaving you to wonder what was happening half the time. The romance was implied, but practically non-existent. It wasn’t based in any type of interaction or real affection so it was hard to emotionally invest in it. I don’t know if it’s just me, but so far the two retellings I’ve read of this legend have been less than stellar. I know I’m probably one of the minority in my opinion of this book, but I can’t help it! If I were you, I’d skip this one and look for a story with a little more…well…more. I’m so glad I read this review. This book was on a long list of books that I’ve been intending to read, but I wasn’t sure I wanted to risk a DNF. The aspects that bothered you are things that would likely irritate me (especially the names thing). I will probably still give it an attempt, but I won’t rush to get to it.